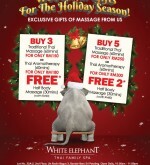 White Elephant offer you a wonderful gifts for the holiday season! 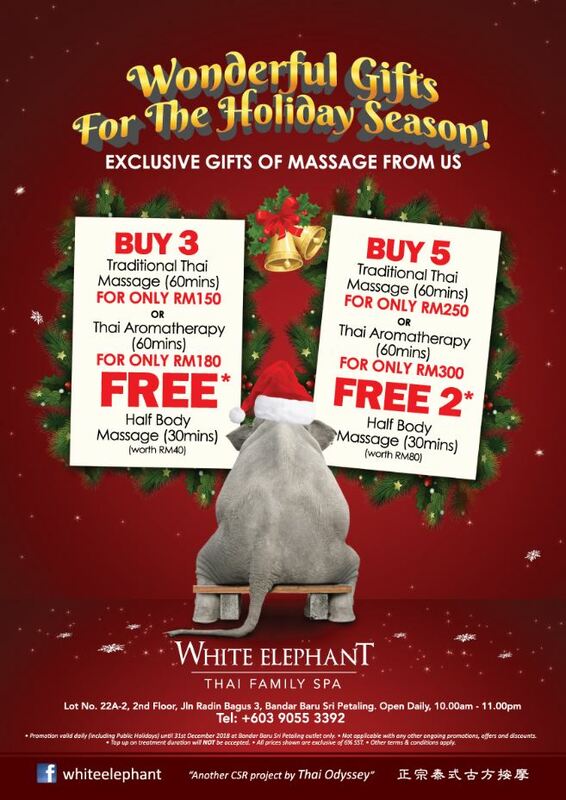 Here come the exclusive gifts of massage from us. Location : Lot No.22A-2, 2nd Floor, Jalan Radin Bagus 3, Bandar Baru Sri Petaling. Call +603-9055 3392 for reservations now! * Promotion valid daily (including Public Holidays) until 31 st December 2018 at Bandar Baru Sri Petaling outlet only. * Not applicable with any other ongoing promotions, offers and discounts. * Top up on treatment duration will Not be accepted. * All prices shown are exclusive of 6% SST.